Boasting of 0.03sec. 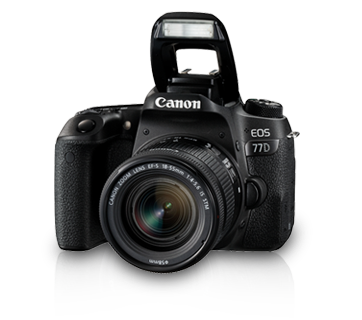 fast-focusing AF during Live View shooting, an attractive variety of functions and high operability, this EOS DSLR will take your photos to the next level. 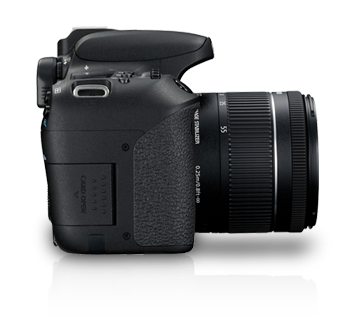 It comes with two electronic dials to enable the same hands-on, analogue operational feel that you get on high-end cameras. Camera settings can be done almost instantly. Normal ISO speed as high as ISO 25600 is realized thanks to DIGIC 7, which contributes to beautiful photos and movie footage with minimal noise and camera shake. The up to 45-point All-cross-type AF system provides AF coverage over an expanded area during viewfinder shooting. 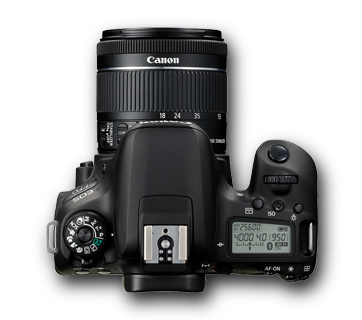 Precision tracking of moving subjects is also enhanced with AI Servo AF II. Of the 45 points, 27 are f/8 compatible, resulting in excellent performance when photographing birds, wildlife and other scenes involving super telephoto photography with an extender. For Live View shooting, Dual Pixel CMOS AF enables extremely fast and seamless AF, working with all AF-compatible EF lenses and achieving focus in low light scenes as dark as EV-2. 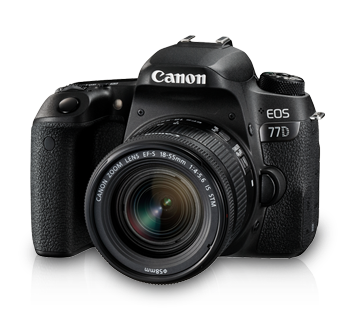 Touchscreen operability adds to ease-of-use, taking you one step closer to creating finely-focused photos and movies like a pro. 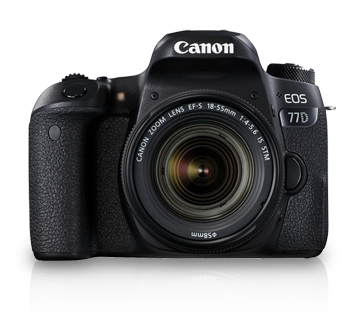 The EOS 77D comes with 2 electronic dials for instant access to the most-used camera functions such as shutter speed and aperture. 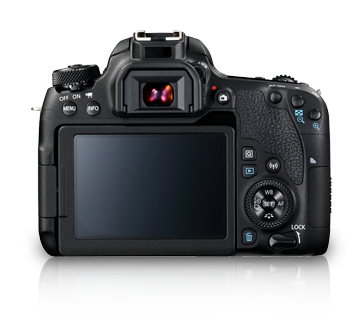 Shoot settings are quickly and easily confirmed by glancing at the backlit LCD panel on the top right panel of the camera. 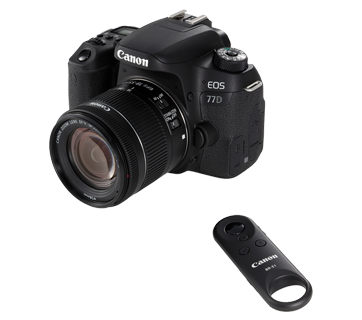 There is also an AF-ON button on the rear for easy access to more advanced but useful functions such as focus lock and spot metering. Intermediate and advanced users will find such a body design in line with their needs and preferences. Support for Full HD 50p / 60p recording enables you to shoot smooth, beautiful videos, with seamless autofocusing that you can operate with the LCD touch panel thanks to Dual Pixel CMOS AF. The vari-angle LCD monitor makes it easy to achieve unique angles for amazing footage that would stun even professional videographers. 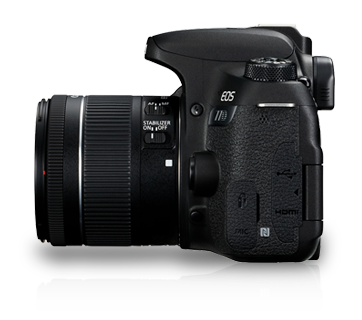 Movie digital IS, which carries out 5-axis image stabilization, increases possibilities in handheld movie-shooting which is especially prone to camera shake. There are 2 levels of stabilization available which you can set to suit the shooting scene. As Movie digital IS uses in-body image stabilization, it works even on non-IS lenses. Additionally, the availability of functions such as 5 Creative filters for movies, HDR movie and Time-lapse movie all promise to make movie shooting fun and exciting.